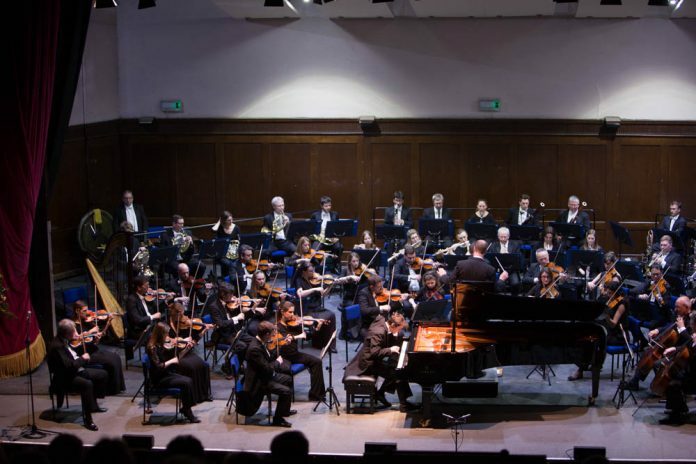 Kenny Broberg made wonderful use of a Fazioli piano last Thursday with the very recently formed Hasting Philharmonic in a most exhilarating performance of Mozart’s 17th piano concerto. To me, the Fazioli seems like a modern piano with all the developmental advantages of over two hundred years but with a slightly “antique” sound, making it perfect for music of the eighteenth century. The orchestra and its charismatic conductor Marcio da Silva gave perfectly judged support to a most poetic soloist and though the beautiful woodwind in the second movement and the brass in the third were given due emphasis, nothing was allowed to distract an entranced audience from the magical piano part. Broberg was the winner of the Hastings International Piano Concerto Competition in 2017 and seems to have a really significant career ahead of him. The Mozart opened this September 20 event in St Mary’s and the concert concluded with another of the composer’s most significant works, the G minor 40th symphony, the second of the three great works with which Mozart concluded his symphony series. It was the first work by this supreme genius that I got to know, at school and more years ago than it is comfortable to remember. Marcio da Silva and his players made the music seem as fresh as ever, bringing out its drama, its pathos and its rhythmic power. It is quite astonishing that this group of players has been together less than two years and it is a tribute to Marcio da Silva that he has made them such a musical asset to our area in such a short time. Their unity and obvious enthusiasm are infectious. Between these two acknowledged masterpieces came a remarkable modern work: Flacubal 95 by Philip O’Meara (b.1984). I have to admit that I did not gain much from the composer’s programme note on this, which relates it to the Mozart G minor which followed it but I can say very enthusiastically that I much enjoyed it as did very many other people I spoke to. Though very modern, it has all the characteristics that music should have but which “modern” composers, shunning tradition, sometimes wilfully neglect. It was immediately accessible, it seemed emotional rather than unrelentingly dry and though it covered a broad range of feelings and dynamics, it had a shape and a structure which gave it coherence. It gained from superb playing by the Hastings Philharmonic and was aided by some beautiful work by their leader, sadly unnamed in the programme; perhaps the orchestra regard themselves as so much of team (and they are) that no individual should be singled out. This was a terrific evening, one to be treasured. Elsewhere at the festival, too few heard Danny Driver’s astonishing piano recital (September 21, St Mary’s) in which he compelled attention with the most intensely felt playing and made the unfamiliar seem to have been always known. Poulenc’s short opera Les Mamelles de Tiresias (September 22, Milligan Theatre) was brilliantly entertaining and extremely topical. It was funny, delightful, ingenious and thought-provoking. Rush along to the September 29 performance but don’t be surprised if all tickets have been snapped up. The City of London Choir under Hilary Davan Wetton (September 23, St Mary’s) were nothing short of sublime and a significant and beautiful contribution to their Durufle Requiem was made by mezzo soprano Marta Fontanels-Simmons and the festival’s own Alison Moncrieff-Kelly (‘cello), to whom all thanks for organising our concerts in 2018. Richard Gowers provided perfectly judged organ support.